Here are 120 excerpts from this great preacher of the Word presented in a daily devotional format. Edwards certainly was an amazing philosopher and a great theologian, but his insights into God's Word are also down to earth, practical, and devotional. Each devotion is based on a Scripture verse and Edwards is always careful to draw your attention to the text to fed by God's Word, not by man's thoughts and imaginations. This book makes a perfect gift to introduce people to the heart searching writings of Jonathan Edwards or the Puritans in general. You will find comfort for the soul, encouragement and exhortations for the heart, and practical instruction for the mind. - Publisher Jonathan Edwards is rightly recognized as the greatest philosopher and theologian America has ever produced. But his greatest contribution to the church was as a preacher and expositor of God's Word. Here are 120 excerpts from his expositional writings presented in a daily devotional format. The source of the excerpt is noted at the bottom of each page. Edwards' insights into God's Word are down to earth, practical, and devotional. Each devotion is based on a Scripture verse and Edwards is always careful to draw your attention to the text to be fed by God's Word. 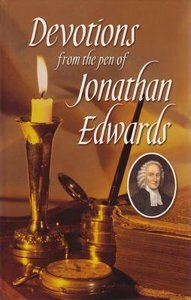 About "Devotions From the Pen of Jonathan Edwards"
Jonathan Edwards is rightly recognized as the greatest philosopher and theologian America has ever produced. But his greatest contribution to the church was as a preacher and expositor of God's Word. Here are 120 excerpts from his expositional writings presented in a daily devotional format. The source of the excerpt is noted at the bottom of each page. Edwards' insights into God's Word are down to earth, practical, and devotional. Each devotion is based on a Scripture verse and Edwards is always careful to draw your attention to the text to be fed by God's Word.